Update, August 3: Lil Wayne’s lawsuit against Universal Music Group has reportedly been put on hold until his other lawsuit, the one against Birdman over Cash Money (the man’s got axes to grind), is sorted. According to the Jasmine Brand, because of the similarity between cases, the outcome of the Cash Money suit is expected to affect the situation with UMG, so a federal judge ruled that the latter is not to go forward until the former is resolved. Bottom line: If you’re one of those unfortunate souls waiting eagerly for Tha Carter V, it’s a good thing you’re getting really good at the virtue of patience, because the Cash Money mess is expected to potentially drag on for another year. Our original post from March 29 appears below. Lil Wayne and his legal team filed a federal lawsuit against Universal Music and SoundExchange over unpaid profits, according to THR. The complaint claimed Wayne hadn’t been compensated for finding and fostering such big-name artists as Nicki Minaj, Drake, and Tyga via Young Money — millions of dollars of royalties Wayne signed for more than a decade ago have instead gone back to Universal to pay off alleged Cash Money debt. “Universal should be grateful and respectful to Lil Wayne for the millions of dollars in distribution fees and profits they have earned on the artists he brought to the company,” Wayne’s attorney told the trade. In the suit, the rapper’s attorneys asked for at least $40 million back, because they believe he’s not responsible for Cash Money’s problems. Wayne’s Young Money offshoot is a joint venture tied to Universal’s Cash Money, but new talent profits were supposed to be split 51/49 between Cash and him, respectively. 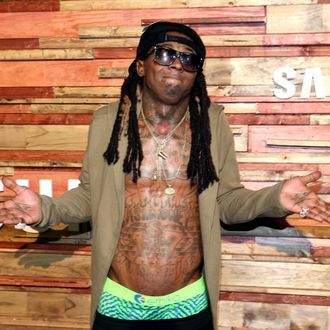 The suit noted, however, that “Universal has claimed a right to 100 percent of the label performance royalties attributed to [Young Money].” As a result, Wayne’s side said SoundExchange, a nonprofit that deals in digital royalties, hadn’t paid, either.